﻿ Dtox fx Natural Detoxifying Ingredients by Dr. Joel Wallach. 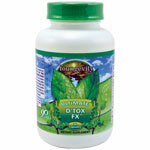 Youngevity® D’Tox fx™ is a proprietary blend of naturally detoxifying ingredients. These ingredients act by binding with impurities and toxins, and help to remove them from the body. Youngevity® D’Tox fx™ helps support and promote optimal health and well-being. If you have noticed a sudden change in bowel habits that persists over a period of two weeks, consult a healthcare professional before using a laxative. Laxative products should not be used for a period longer than one week, unless directed by a healthcare professional. Rectal bleeding or failure to have a bowel movement after use of a laxative may indicate a serious condition. Discontinue use and consult your healthcare professional.